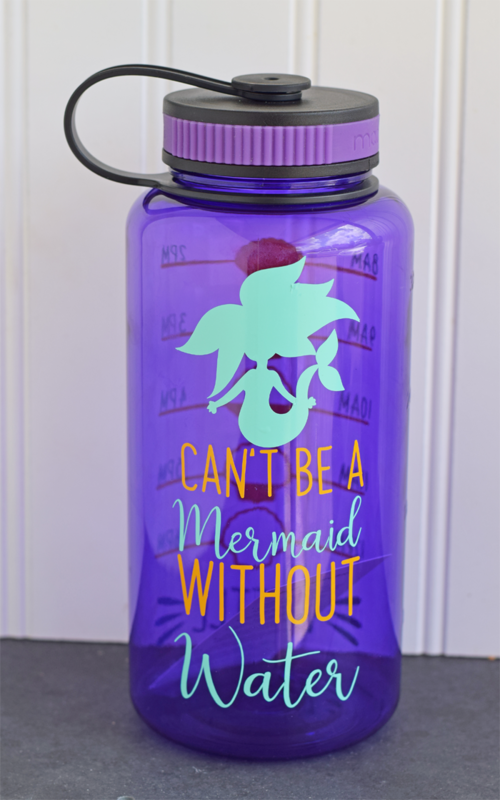 Learn how to make a DIY Mermaid Water Tracker Bottle with your Cricut machine and an awesome bundle from DesignBundles.net. This post is sponsored by FontBundles. This post contains affiliate links which, when purchased through, provide a small commission to It Happens in a Blink, LLC at no additional cost to the consumer. Finding reputable online resources for SVG files can be difficult. And if I want a file with a commercial license, hello confusing legal-ease from most sites! So when I find a site with an easy to understand license AND cute cut files with unique fonts, I’m excited to share it. FontBundles.net is a fabulous site that offers a large assortment of fonts that crafters can use in designing or Cricut projects. 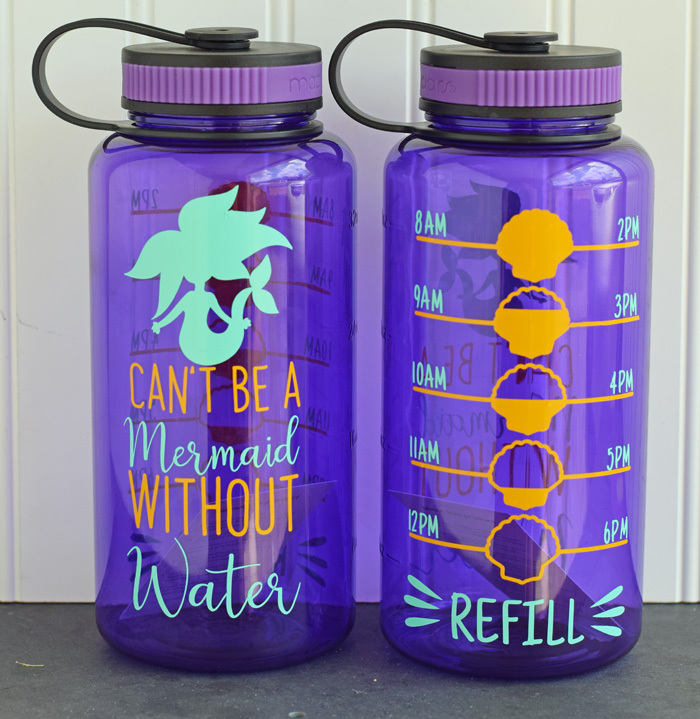 But don’t let the name fool you– FontBundles.net also has great project SVG files, like this cute DIY Mermaid Water Tracker from their sister site DesignBundles that I’m sharing today. 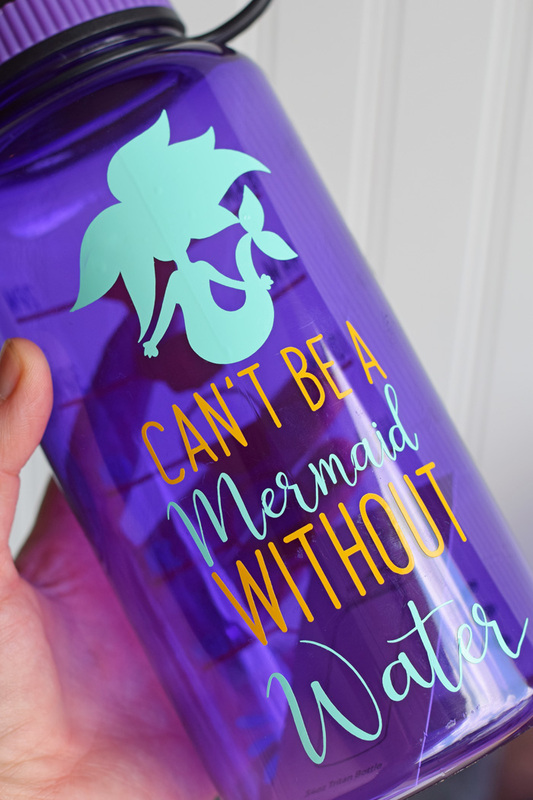 If you struggle getting enough water throughout the day, maybe a cute water bottle is just what you need! 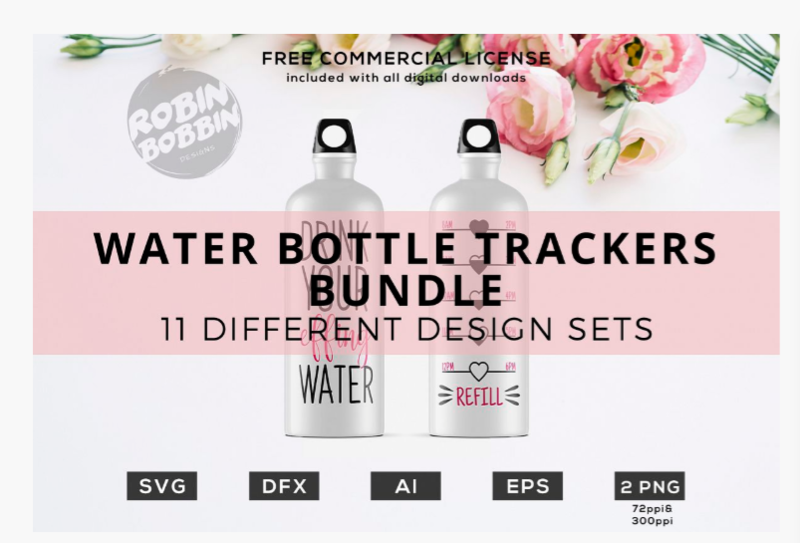 In the Love to Craft Volume II Bundle from DesignBundles.net, I found 11 different water bottle tracker options. 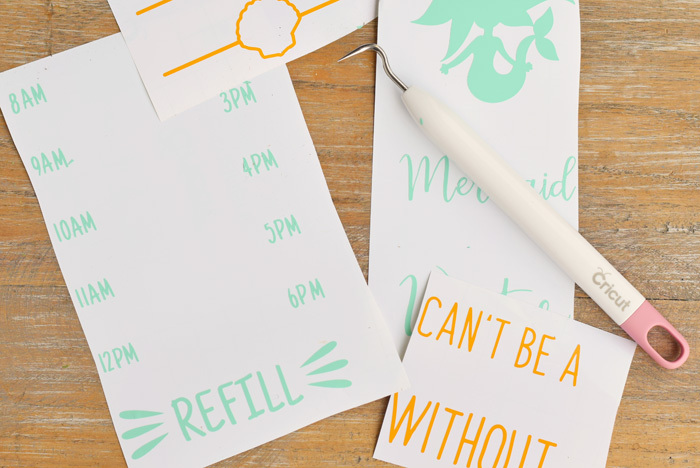 Each one comes in a variety of formats, including SVG (perfect for Cricut Design Space!). 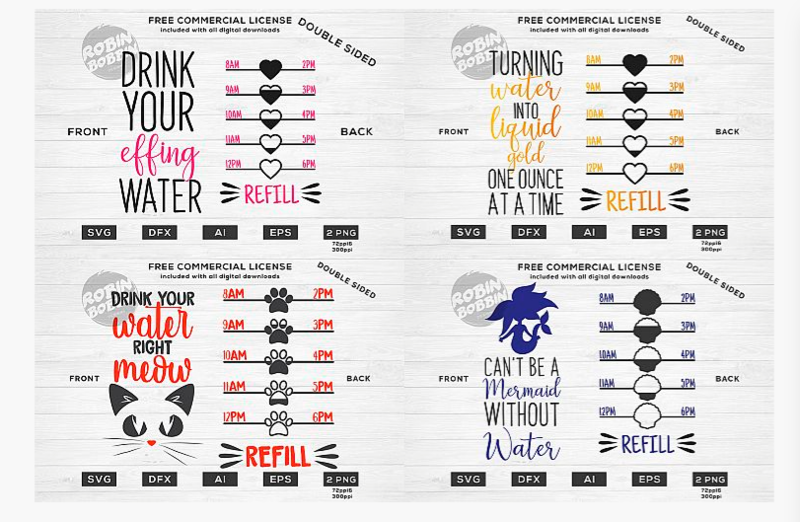 I downloaded the file to my computer and then uploaded the water tracker files to Cricut Design Space. If you have never uploaded files before to Cricut Design Space, be sure to check out my step by step tutorial on Uploading SVG Files to Cricut Design Space. 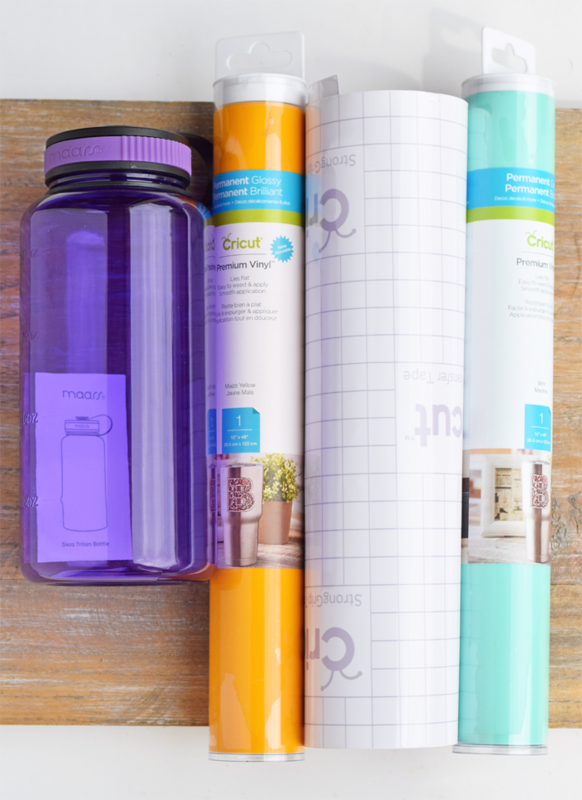 After uploading the SVG to Cricut Design Space, gather your supplies and get to crafting! 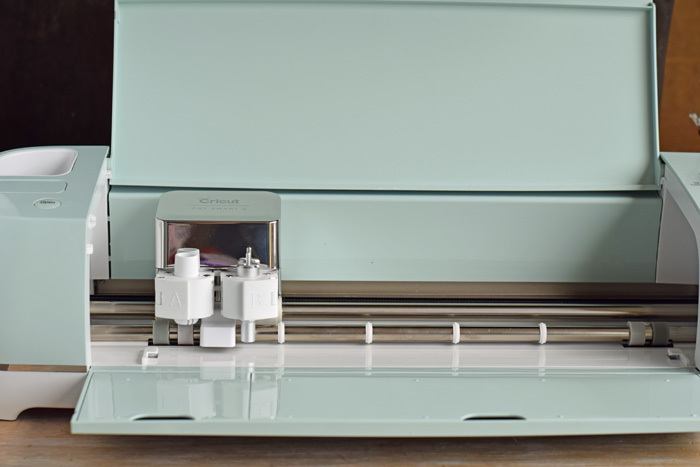 Open up Cricut Design Space and start a new project. On the left hand panel, click “upload” to find the tracker files that you have uploaded. Insert the Mermaid Water Tracker files into the new project. Grab your measuring tape and your water bottle. Measure the height of the bottle where the vinyl will go. Resize the trackers so that they are about a half inch smaller than the surface of the bottle. I prefer that my vinyl not go over the rounded edges of the flat surface of the bottle, thus the reason for the half inch decrease. Ungroup each water tracker SVG. For the words “Mermaid” and “Water,” the places where the letters touch need to be welded together. If not, they will cut into one another. Since the letters are already touching, simply select the two letters that are side by side and click “Weld” in the right hand panel on the bottom. Next, attach the same vinyl colors together so that they will cut in the correct placement. If the colors are not attached, then Cricut Design Space will not send them to be cut the way that they are ordered on the project. 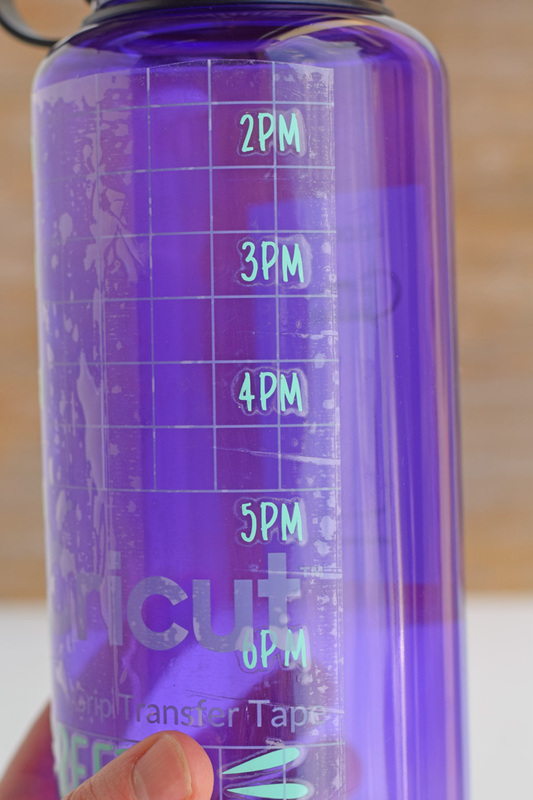 For me, on the water tracker side, I attached the times and the “Refill” at the bottom to cut in the Mint color. I then attached the shells to cut in the Maize color. For the mermaid side, I attached the mermaid shape and the words “Mermaid” and “Water” for the Mint vinyl I attached the remaining words to cut in the Maize vinyl. After attaching the pieces that go together, group the images back together. 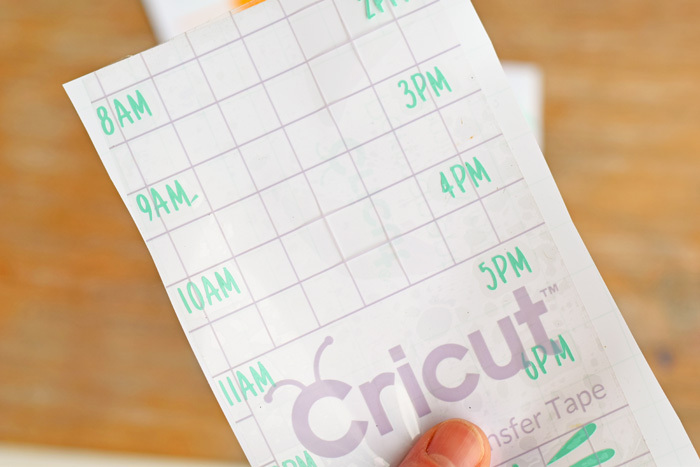 Send the files to be cut with your Cricut machine using the Permanent Vinyl and the StandardGrip cutting mat. Once the files have been cut, use the Cricut Weeding Tool to remove the unnecessary pieces of vinyl. Cut a piece of transfer tape and place it over one of the weeded pieces. It doesn’t matter which one that you start with, but I chose to begin with the times. Peel the transfer tape off, making sure that the vinyl accompanies it. 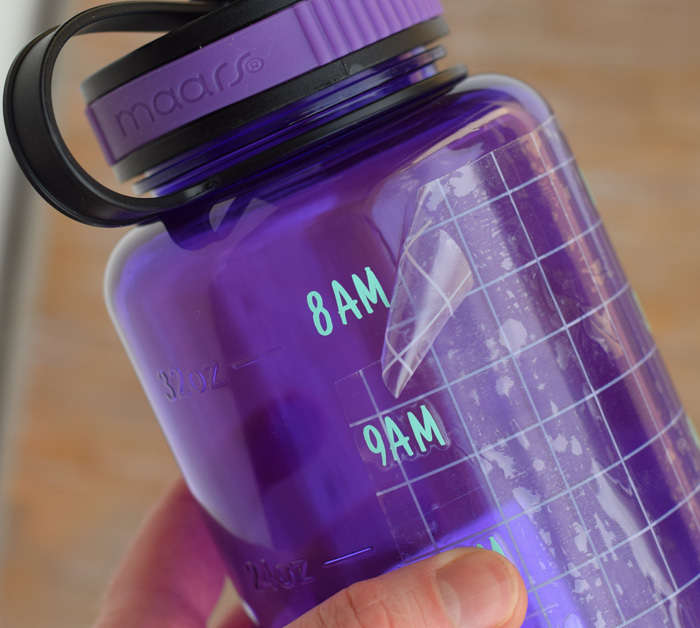 Place the transfer tape on the water bottle. I choose to place mine on the sides so that the recipient of the water bottle could still use the true ounce measurements on the back. Carefully peel the transfer tape back, leaving the vinyl on the bottle. Repeat with the remaining vinyl pieces until the bottle is complete. Bundles on FontBundles.net or DesignBundles.net do not stick around forever! Grab the Love to Craft Volume II while it lasts. 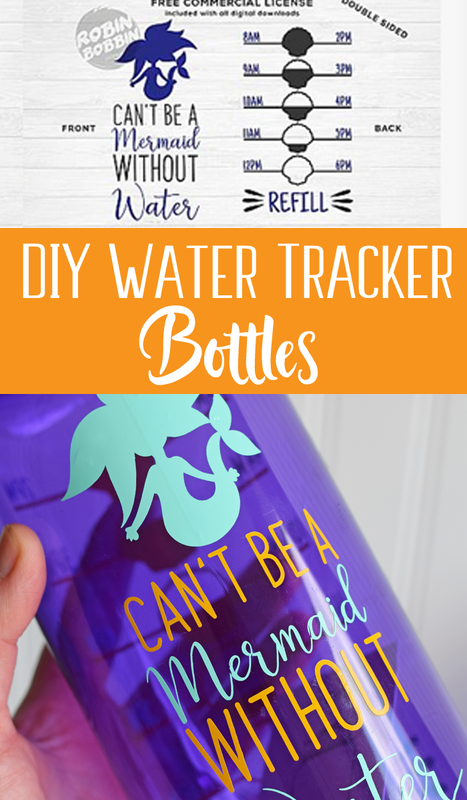 It includes these cute Water Bottle Trackers PLUS a bunch more cute fonts and designs (umm, hello unicorns!) at an excellent price. With all of the options on the website, crafters can get creative with their projects for all times of the year! Now for a fun giveaway! FontBundles.net is giving one lucky reader the chance to win a Love to Craft Volume II bundle. Use the Rafflecopter form below to enter to win. This giveaway is only open for two days, so enter to win before time runs out! Fine print: Giveaway details: Void where prohibited. Giveaway ends on June 27, 2018, at 11:59 EST. Winner will be notified via email by It Happens in a Blink, LLC. FontBundles.net is responsible for delivering the bundle. Winner must create an account at FontBundles.net in order to receive the bundle. It Happens in a Blink is a participant in the ShareASale Affiliate Program and the Amazon Affiliate Program, an affiliate advertising program designed to provide a means for sites to earn advertising fees by advertising and linking to Cricut.com and Amazon.com. I struggle to get my daughter to drink enough water so this idea is great! Mermaids are so popular right now. I love the pastry script! 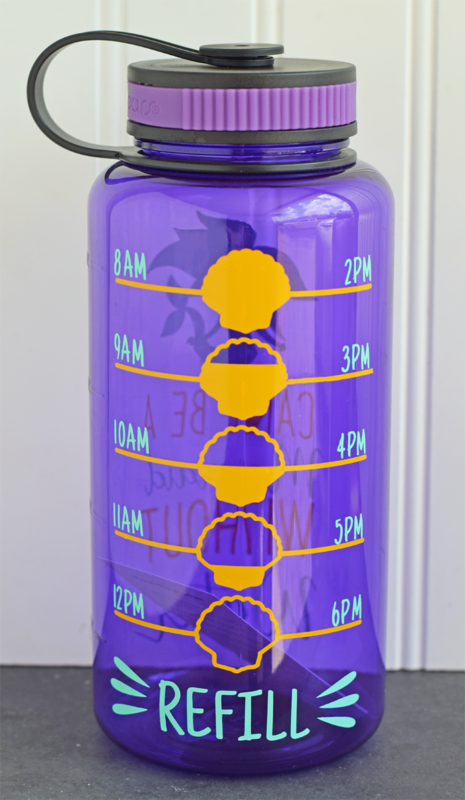 This is such a fun way to ensure you are drinking enough water. I really like the “drink your effing water” design haha. I wish I had a Cricut so I could make this for myself! This is awesome! I always wanted to get some of these labels onto my DIY house cleaner. Thanks for the tutorial! I have just recently got a machine and I don’t really know much about it yet but this is exciting. I picked mine up at a garage sale, it was a machine, a few different fonts and keyboards, a box full of different colored vinyl. I picked up all of that stuff for just $25 so I decided I could not pass it up and brought it home. It works great but I wasn’t sure what type of projects to do yet, this looks fun! I love this so much! My favorite is the Drink your effing water. I have good days and bad days and really need something to help me to drink my water. I have a cricut but haven’t used it yet – I just need some time to read the book on how!!! This inspired me, I’ll be crafting! !